My third graders have grammar every-other week, as we alternate our grammar lessons with spelling. I love finding other books and resources to use alongside our grammar workbook to help them really grasp on to some of the biggest concepts. Recently we finished up our unit on nouns by focusing in on the differences between singular, plural, and possessive nouns, which included sharing large sections of The Girl's Like Spaghetti together. The Girl's Like Spaghetti by Lynne Truss is a the follow-up book to Eats, Shoots and Leaves and its companion picture book of the same title. 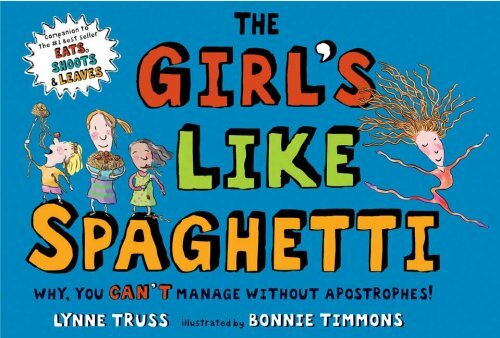 Whereas Eats, Shoots and Leaves introduces the importance of the comma and its placement, The Girl's Like Spaghettii is all about the apostrophe. After a quick discussion of the title and the two different versions (the girls like spaghetti and the girl IS like spaghetti), we move into some of the other sentences provided by the book. I like to use the SmartBoard to first present the sentence or phrase without any of the punctuation. Many students can then figure out at least one of the possible interpretations, and we will draw in the apostrophe and talk about what happens to the meaning as we shift the apostrophe around. You can easily gauge student understanding and engagement by who starts laughing and how quickly. Some of the sentences are easier for kids to parse than others. I often like to start with some of the more straight-forward ones like See the boys bat. Students can quickly see the connection to our earlier discussion about possessives and re-interpret the sentence as both See the boy's bat and See the boys' bat.